Just as gyms reach full capacity in January, the hiring market will be fierce and full of frenzy for Bilingual talent next month. If you’re hiring, now is the time to ramp up your search. Though the weather outside is getting colder, the search for Bilingual/French talent in the Greater Toronto Area is continuing to heat up with no end in sight. Fierce. That may be the best way to describe how competitive the market has become for Bilingual/French talent and unilingual candidates too! In all of our years in business, we’ve never seen demand to be as high as it is right now, and we estimate that this hasn’t reached its peak yet. Top Bilingual talent are receiving multiple job offers all at once, and companies are working at speedy paces to hire them so as not to lose them to competition. If you’re on the hunt for Bilingual/French or even unilingual talent, the best time to get that search going, is right now. Since many people generally slow down for the holidays, smart and savvy employers leverage this season to get a leg up in the marketplace. Maximize the remaining work days in December, and connect with in-demand talent right now while they have fewer employers vying for their attention. We predict you’ll be thankful in January that you’ve done so. Cheers to your hiring success! 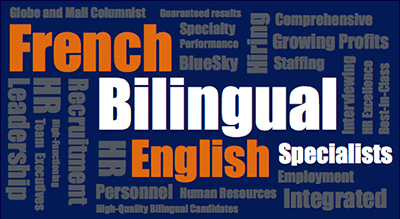 If want to super-charge your search for Bilingual/French talent, call us today at: 416-236-3303, or email us at: info@blueskypersonnel.com. We are connected to the market’s best Bilingual/French talent, and it would be our pleasure to help you.